The Central Bank of Nigeria, CBN, has expressed worry over N11.7 billion spent on the importation of 65,809 tonnes of processed tomato paste into the country annually. Lamido Sanusi, the Central Bank governor, said this on Tuesday in Abuja at a one-day stakeholders’ forum on partnering to build a competitive tomato industry in Nigeria. Mr. Sanusi was represented at the occasion by Sarah Alade, the Deputy Governor, Economic Policy. 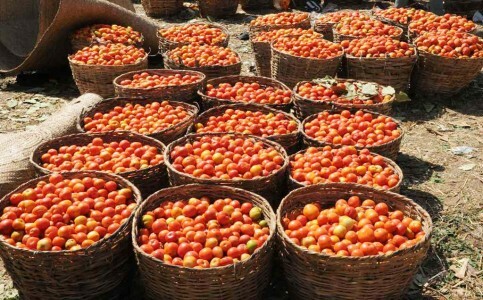 The governor, who said Nigeria was the 14th largest producer of tomato globally and second in Africa, noted that the country imports processed tomato paste valued at N11.7 billion annually. He attributed the reason for the huge volume of imports to the dysfunctional agricultural value chain system in Nigeria. He said that this would result in a loss of about 50 per cent of the tomato produced in the country to lack of preservation, poor marketing, distribution and access to markets. The governor, who expressed the determination to help build a competitive tomato industry in Nigeria, said that there was the need to develop successful and effective partnership among the stakeholders. “There is need for partnerships by producers with key processors to increase their competitiveness and locally source raw materials to replace imported tomato products, increase jobs in rural areas and reduce poverty. “To this end, the CBN has been working assiduously with producers, leading processors and other stakeholders,” he said. Mr. Sanusi said the forum was organised to strengthen Nigeria’s tomato industry through partnerships, noting that the array of stakeholders at the forum was a demonstration of Nigeria’s potential in tomato production. The governor also said that the CBN had initiated an intervention fund of N200 billion Commercial Agriculture Credit Scheme (CACS) and Nigeria Incentive-based Risk Sharing System for Agricultural Lending (NIRSAL) to boost the sector. He said the scheme had disbursed a total of N199.25 billion to 270 projects, including 30 state government projects. He said that NIRSAL was introduced to stimulate agricultural development in Nigeria through value chain financing. He stated that the programme would build capacity of banks to engage and deliver loans, reduce counterpart risk through an innovative crop insurance scheme, and reward performance in agricultural lending. “It has issued 20 credit risk guarantee to counter parties valued at N5.01 billion and signed a Tripartite Memorandum of Understanding on technical partnership which will give access to 100 million dollars USAID funds to guarantee counter parties for agricultural lending,” he said.